PLUTO - A success or a failure? Discussion in 'Weapons, Technology & Equipment' started by Old Git, Oct 31, 2018. Sitting here drinking coffee and going through a stack of old RE Journals, and Sapper Magazines, from the 60's, 70's, 80's and 90's (fascinating stuff!). Anyways, just come across an article by Maj-General Eustace F. Tickell, KBE, CB, MC on the supply of POL to 21st Army group. Tickell seems to be saying that PLUTO wasn't used at all. "As soon as mine sweeping had been completed the laying of the PLUTO pipes began, but the first two leaked badly and it was not until the fourth, starting on 12th August, had been laid and tested that any petrol arrived in Cherbourg. By then tankers were discharging at the port and the Americans were pumping southward, so PLUTO was closed down, having delivered no petrol to the Allied Forces. The line from Port en Bessin was completed as an insurance but was never used to supply the British Army. " "On 28 October the first useful cross-channel petrol began to flow at about 250 tons per day. It was nearly five months since the Normandy landing"
I mention this because I've always been under the Impression that PLUTO worked right from the off and that it was a major success, obviously I've been labouring under a misapprehension all this time. Is this news to anyone else? I certainly did not know that, but then again for a long time I was unaware of PLUTO. I've already downloaded that report and give it a peruse as soon as I have finished what I'm doing now. Tickell says that the pre-D Day estimates for PLUTO was "about 250 tonnes per day to Cherbourg". I do wonder if the writers of that report are extrapolating from the planning estimates, or conflating DUMBO figures with PLUTO. Or, if the supplies delivered by Tanker, and then piped ashore, are being mistaken for PLUTO deliveries. Certainly worth a discussion or two methinks! Don't forget that PLUTO pipes were later laid from Dungeness, this could account for quite a bit of the total. Among the greatest of the supply problems was how to get petrol (gas) across the Channel and on to the fighting units; in particular the Americans required it in vast quantities. The British were fortunate that they had been able to copy the German, hence ‘jerry’ cans. These were far superior to the cans that they had used until then; but handling vast numbers of these would have been near impossible. The alternative was bulk handling with tankers; but these were always in short supply and required quite sophisticated shore facilities, something they knew would probably not be left in operational condition at the Normandy ports. Also oil storage tanks could easily be set on fire with shells or by sabotage. The ships were susceptible to attack by U-boats, E-boats, aircraft and shelling. It was decided that the best solution would be to lay pipelines from Britain to France; but, like the Mulberry harbours, no one had ever done this before. The project was codenamed PLUTO, which has been accepted as being an acronym for Pipe Line Under The Ocean. This may, or may not, be correct. There are no explanations for the other codenames that were used for shorter fuel pipes: TOMBOLA and AMATHEA – see Port-en-Bessin below. The first prototype was based on submarine telephone cables that had been developed over many years; but without the conductors and insulation. Here the codename was HAIS, which stood for - Hartley, Anglo Iranian, Siemens: in order – the head of development, the oil company he worked for and the manufacturers. When a test pipe was laid by a Post Office cable ship in the Thames Estuary it worked well, so an order was placed for a slightly larger version. Other tests followed; then a pipe was laid across the Bristol Channel only seven months after the scheme had originally been proposed. This was done by an especially modified ship HMS Holdfast, the former Dundee Perth and London Shipping Company’s London. The Holdfast could carry and lay thirty miles of HAIS cable. Ellerman’s Algerian was similarly modified. Neither vessel could lay a single run of pipe from Britain to France, so two standard MOWT tramp ships were also converted. The Empire Ridley became HMS Latimer and the Empire Baffin the HMS Sancroft; both could handle 100 miles of pipe. In their time, they were the two largest vessels of their type in the world. Two motor barges were modified to land the shore ends and various other small craft were requisitioned. The reader might wonder what this has to do with Merchantmen at Normandy; it is that the crews of these vessels had almost all been merchant seamen. The next problem was that there was not enough lead available to manufacture the pipe needed. This problem was solved with the design and manufacture of a flexible steel pipe. For this design, the Iraq and Burmah oil companies were approached. This pipe was named HAMEL after their chief engineers H A Hammick and B J Ellis. The less flexible steel pipe required a larger drum size than even the bigger ships could mount; so an enormous floating drum was designed, which had cone at one end. This became the Conun drum, or Conundrum. Two HAIS and two HAMEL pipes were laid across the Channel in August, the first by HMS Latimer in only ten hours. The project was not without its problems and it was not until 22 September that pumping began. Even then, the flow rates were less than had been hoped. This meant that tankers were still needed to carry fuel across the Channel and many cargo ships were also loaded with petrol in jerry cans. Four ship-to-shore pipelines were laid off Port-en-Bessin. These were in operation by the 24 June and could handle six hundred tons per hour, though they seldom achieved that throughput. The PLUTO system came into its own later, when eleven HAIS and six HAMEL lines were laid from Dungeness to Boulogne. These were soon pumping up to one million gallons of fuel per day. Intentionally left blank - because I duplicated the post! And I now see that there is much more in the report posted by Clive. 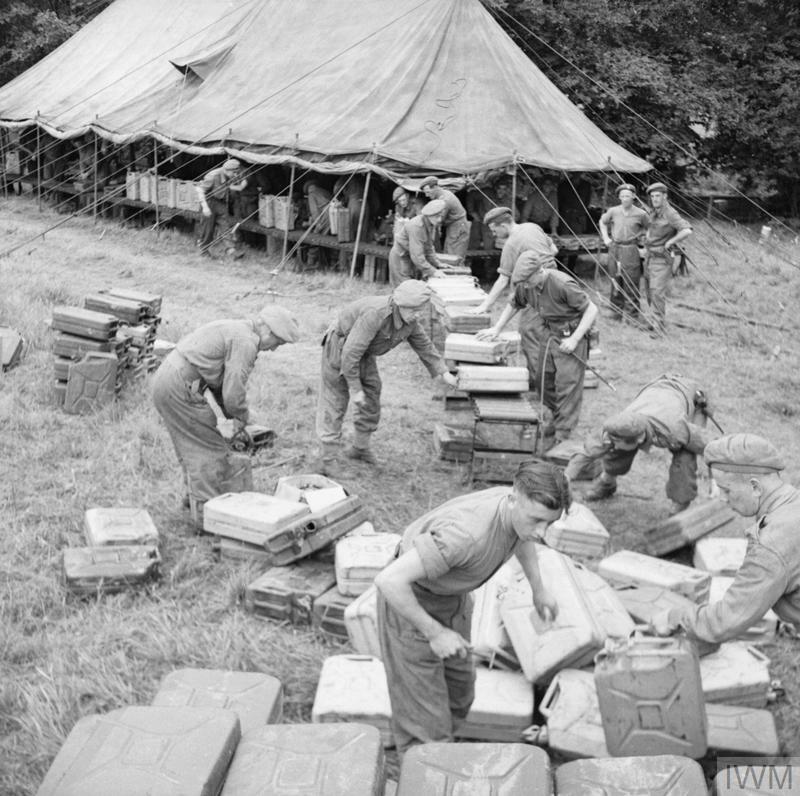 Interesting to note that when the Allied armies entered France in June 1944 they took with them 22 Million Jerry cans, but by August over half of these had disappeared (either stolen or sold\bartered to French Farmers) and according to the historian who wrote the book on the Allied Logistics problems, Martin van Creveld, "the loss of this humble item limited the entire POL (Petrol, Oil, Lubricants) supply system" for the entire, advancing allied armies. Patton may have liked to blame the British in general, and Montgomery in particular, for his lack of fuel but the truth was that the lack of Jerry cans and the distance from the Normandy coast was a major problem for all Allied forces operating in Northern France and Belgium in the Autumn of 1944. An attrition rate of more than 50% over two months is staggering! At this point in PLUTO's history it is necessary to emphasise that the pipelines across the ocean were not the only device which came under the code-name PLUTO, and from the army point of view they were the least dependable part of the operation. The 'TOMBOLA', and the 'ARETHEA' inspired more confidence in the army planners. The 'TOMBOLA' consisted of a six-inch pipe-line of a length up to three thousand feet, laid along the sea bottom from storage tanks ashore with a buoyed flexible connection at its seaward ends, which tankers would pick up prior to discharging their cargoes. The 'ARETHEA' was a similar construction, but it was a ten-inch pipe-line towed from the United Kingdom, and sunk in the required position on the far shore. This was only to be used if the site was unsuitable for 'TOMBOLA'. The relative importance attached to the cross-channel pipelines, and the ship-to-shore pipe-lines is illustrated by a correspondence between General Brownjohn and Admiral Creasey in December 1943. Brownjohn had envisaged Operation PLUTO as a 'grant-in-aid', not because it was unimportant, but because it was so highly experimental; this was, as he explained to the Admiral, before he had realised that PLUTO also covered the ship-to-shore device. Admiral Creasey confirmed that: - "Army plans were based on the use of the ship-to-shore method of importation of bulk petrol at an early date, and that any bulk importation of petrol by the cross-channel pipe-lines is looked on in the army plan as a bonus, and is not relied on". So the quote of 575,000 tons 'pumped by Pluto' most likely covers the oil Pumped from tanker to Port-en-Bessin via Tombola as well as the that, eventually, pumped via Dungeness and Dumbo. The Pipeline from the Isle of Wight to Cherbourg never worked and it would seem, as the report indicates, that the Army were correct in their planning decision when they decided not to rely on it and to see it as a 'bonus' if it did work. So when we talk about PLUTO getting Petrol to Normandy we need to understand that this operation covered both undersea pipes and tankers and that, in actual fact, the undersea pipes did not work for the whole of the Normandy campaign! The use of Disney characters for Code names is also interesting and raises questions of what came first, the code name or the acronym, especially as Operation Pluto was principally concerned with getting POL to the Landing beaches, via the Army's preferred method of Tanker, and that the undersea pipes were merely 'experimental' and a 'hopeful bonus' if they worked, but were not to be depended upon! timuk, Roy Martin and Seroster like this. "The Cherbourg pipe delivered a relative trickle compared with the bulk supplies that were being landed at captured ports." On Dumbo, the Dungeness to Boulogne pipe. "Although the delivery rate was impressive it actually represented little more than 10% of fuel transported across the Channel and this was achieved too late to have any impact on the campaign". rick wedlock and Osborne2 like this. Role of tramps and lighters in sustainment of POL in Normandy is completely overlooked, but absolutely essential. Many skeewhiff perspectives on the campaign and OP's post shows sheer risk of relying upon a single source. PLUTO,PLUTO PIPELINE,PIPELINE UNDER THE OCEAN, ......another article on the Pluto operation. ATB covered the operation a few years ago. I have an acquaintance who as young mechanical engineer was employed by Orthostyle,a Scunthorpe fabrication company.They were contracted to manufacture the 5 x 30 foot diameter steel drums and was involved in the project...highly secret.....he was told that the fabrications were for buoys. There is a very informative map published by Michelin to commemorate the 50th anniversary of the Normandy Campaign.It was based on their 1947 map which shows the progress of the campaign and is derived from the Service Geographique de l'Armee.Also included is the Pluto pipeline system and the routes taken.The map also indicates the bridges or ferry crossings still down and the expected date of renewal,eg Tancarville car ferry destroyed.....no bridge in 1944..... expected to be reinstated by December 1947. The Pluto system,composed of five pipelines is shown entering Cherbourg at the extreme west end of the harbour breakwater and splits up at Octeville south of Cherbourgon the N 804, one pipeline routing down the east side of the peninsula,the other passing the west side of the peninsula. The east pipeline passes Valognes and Carentan with a branch into Port en Bessin. The pipeline pipe continues, to pass on the south west sides of Bayeux and the Carpiquet airfield, then south of Caen. and continues south of the N13 to run parallel with it at one point,bypassing Lisieux and continue parallel with the N13 and on in the direction of Bernay and beyond in a north east direction. The westside branch routes down to Lessay,turns south east to St Lo,on to Vire,then to Domfront.It then continues in the direction of Alencon. SDP and timuk like this.